The New York City Department of Environmental Protection (DEP) is building rain gardens and other types of green infrastructure to manage stormwater and improve water quality in local waterways. Reduces temperature during hot weather. Curb inlet - The inlet allows water to flow into the rain garden as it flows down the curb toward the catch basin. Outlet - Larger rain gardens also have an outlet. If the rain garden fills to capacity, water can exit through the outlet and continue into the catch basin on the street corner. Stone Strip - The stone strip allows people to step out of their cars without damaging the plants. 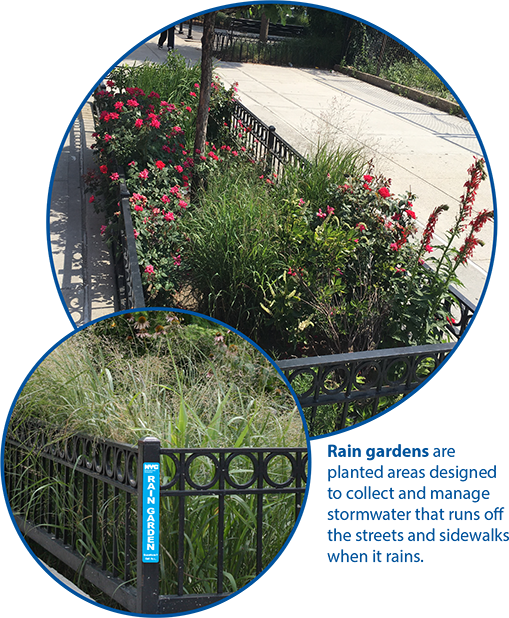 Plants - All rain gardens have plants and grasses which have been carefully selected to ensure they can survive on busy New York City streets. Soil - The soil is graded so that water ponds in the center of the rain garden. Tree Guard - All rain gardens have tree guards around them that protect the plants and keep people and dogs from walking inside of it. Tree - DEP plants trees in rain gardens as often as possible. Trees benefit neighborhoods by lowering temperatures in hot summer months, improving air quality, and providing habitat for birds and butterflies. For additional information about rain gardens, download our printable brochure in multiple languages. This interactive map allows users to receive updated information about green infrastructure projects. Users can enter any address and the a map will zoom in to that location. If you received a letter about the planned construction of a rain garden or other green infrastructure practice in front of your property, click here to find out more information.